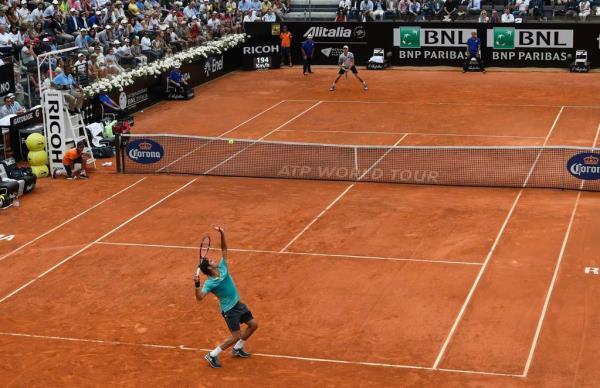 A relatively routine victory for Federer here as he defeated big serving Kevin Anderson 6-3 7-5 to make the Quarter Finals at the Internazionali BNL d’Italia where he's looking to lift the title for the very first time. Up until 5-2 in the second set it was looking like an impeccable performance but Roger switched off just before the finish line and was broken twice when serving for the match. Fortunately he regained his composure to break serve himself and serve it out 7 games to 5 at the third time of asking. Anderson won the toss and elected to receive which was a strange choice. Federer then held his opening game to 15 before breaking Anderson instantly for a 2-0 lead. Roger set the tone for this match pretty early – using the dropshot to exploit Anderson's subpar movement and also going in behind to wrong foot the 6ft 8″ South African. The break was soon consolidated by Roger for 3-0 and despite Anderson starting to find some range on his first serve he couldn't muster more than one point in any of his remaining return games as Roger closed out the set 6-3. Anderson required a solid start in set 2 but he was broken again in his opening game, this time from 30 love up to fall 1-0 behind. Roger again consolidated quickly, hitting a genius backhand at 30-15 en route holding for 2-0. However whilst serving for the match inexplicably got broken from 40-15 up, serving a double fault on break point to let Anderson back into it. The South African quickly held to 15 and again broke the Federer serve with some nice returning to level at 5 games all. With the wind in his sails it looked as if Anderson was going to take the set into a tie break at the bare minimum but after a double fault on the opening point and two sloppy mistakes he dropped his own serve which allowed Roger a third chance at serving it out. This time he made no mistake, doing so to 15 to book his spot in the quarter finals. I had to adjust and react differently in today's match than yesterday's match, it was so different, because it's Kevin and his amazing serve. There's only so much you can do on the return games. The first thing was not to get frustrated, because I was not seeing where he was serving. But thankfully, I got off to a really good start in both sets. From then on, I could relax almost. I was able to break him four times, which was a really good effort in the quick conditions here in Rome. Almost a peRFect performance from Roger in this one as he basically gave Anderson a lesson out there, using all his variety to cause the South African a ton of problems. In fact the only blemish is that he completely switched off at 5-2 to let Anderson get back to 5 all; looked like a case of his mind already in the locker room because he was cruising over the line without ever looking troubled. Not a huge problem as he broke again at 5 all but by that point Anderson had managed to get himself back into it when he shouldn't have been allowed to. Aside from the lapse though it was a clinical display from Fed and Anderson must really hate the match up; Roger throws in a ton of low bouncing angled short balls and Anderson just can't seem to handle them, struggling to pick them up, getting himself out of position and then struggling to ever recover in the rally. Even though Anderson's serve is dangerous if Fed gets it back he can play well within his comfort zone during the rallies and just keep things on his terms. The South African isn't a strong returner either so Fed has a ton of breathing room on serve; hence the free flowing play and drop shots played at will. Check the highlights above for a handful of sweet drop shots and back to back backhand smashes. Next up is Berdych who saw off Fognini in a third set tie breaker which was quite impressive in front of a hostile crowd. Berdych played a very clutch third set breaker against Isner in Madrid and he followed that up again today against the Italian. So far he has had a pretty good year and he looks to have improved a bit in the mental department, still far from the best but he's making the latter stages at pretty much every tournament he plays and is now ranked at a career high #4. 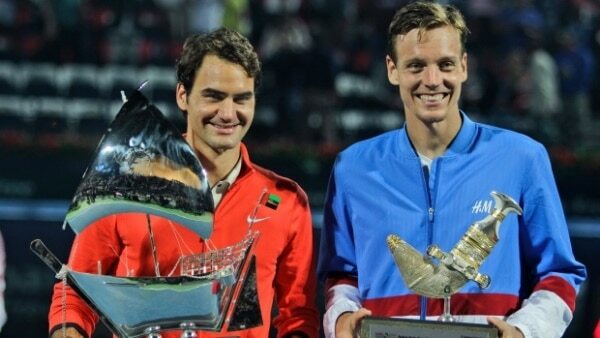 The last time the two met Roger schooled Berdych in Indian Wells but most of their recent encounters have been very close and they've split their last 4 meetings on tour. Roger leads the H2H comfortably 13-6 but the Czech is definitely capable of doing some damage with his heavy game and his self confessed love for the matchup which he thinks favours his game which gives him that added dose of confidence. Based on form and past meetings it is very hard to predict, usually when Berdych faces Nadal or Djokovic it's a virtual walkover but against Roger he tends to play at a better level purely because the matchup suits him more. I think if Roger plays how he did in Indian Wells and uses his skills to drag Berdych around the court then he can get it done in two tight sets. However if Berdych can take charge from the baseline and not have to come out of his sledgehammer forehand + cross court backhand bubble then it could get tricky for Fed especially in what he described as fast conditions. I'll pick Fed to get it done in two sets. Looked like the peRFect performance from Fed up until 5-2 in the second set when he got broken twice serving for the match but still a good performance to win in straights. 3 titles in a row, dunno if that has ever been done before! BH still looking gd! I fancy his chances v Berdy. Fed looking full of energy, whereas u thought he was less bouncy in Madrid. Berdy was somewhat passive v Fogs and if he had come in he might hv got the job done earlier. Fed looks comfortable with the court pace and will be day again, better all round! Allez! Yeah I forgot to mention the tiredness factor for Berd, was a long match. Should work in Fed’s favour, less pop on the serve and step slower round the court hopefully. Um…. “wobble”? That was some wobble. What the heck happened? Hope he knows what it was, ‘coz that won’t do against the upcoming opposition. Amazing really that his stats still look so good in spite of that 3-4 game stretch. Main thing is he’s got the win. Berdych had a doozy vs. Fognini, so Fed should be fresher, but really there’s no telling till tomorrow. Same time match as today. Hope he brings the good stuff. Is Lammer, like, officially on his team now or something? Lammer looks like the bag carrier….. I think he’s just around for the ride – but perhaps he’s back-up confidante when Mirka doesn’t go! And yeah bit earlier today, only 1 women’s match before Fed so should be starting bang on the scheduled time. Man – really surprised Fed let Anderson back in at 5-2. Can’t figure out what happened. Was getting nervous – like 2 different players for a while. Glad he steadied the ship. Right on Jonathan. Some great shot placement to the giant’s toes. Really looks like Fed has some energy and aggression right now. Hope he can keep birdman guessing and not fall into a baseline slugfest. I think we’re all befuddled by the loss of those two breaks – 1st one a switch-off for some reason; the second because he was pissed he lost the first one! Commentators said that Berdy said he needed to sit down at press conference. I think the match against the Fog probably left him pretty tired which *may* have some bearing tomorrow, as the Anderson match was hardly tiring – mostly short points. I hope that Feds can keep those short tomorrow also. Have to say Fognini has a mean slice himself and caught Berdy out on this one a number of times. The first one seems like he want to end up quickly (below 1 hour). Thats what I thought when 5-2 (time is 58′), I was thinking ‘come on, come on, finished it before 1 hour’. Anyone feel the same? We might think that Amar – I confess I always glance at the clock to see how long players have been on the court – does Federer notice? Probably not. He has to be aware of it, there’s a big clock in front of his face at the back of the court constantly in his peripheral vision. I never really pay much attention to match time myself when watching though until it’s finished or you know its going to be a stupidly short one. Hey all, what’s up?? So…. what about Roger huh? He keeps cutting his curls (stop that Roger) and he keeps getting thinner. Or is that just me noticing that?? His match against Kyrgios was great, unfortunately he ended up losing that one. But his match against Cuevas was WOW. Some nice great points, also today against Anderson. About Cuevas… I really like him. He is a good player, plays fast, makes nice points and is very normal. If it wasn’t against Roger, I would be rooting for him. By the way, did you guys notice that Cuevas plays…. a bit like Roger?? Somehow he reminded me of Roger !!! And what about today’s match against Anderson?? I swear, the older Roger gets, the more excitement he wants. Easy win?? No !!! Why should he?? Why make it easy on him and his fans?? No, the dude has to make it difficult for himself. 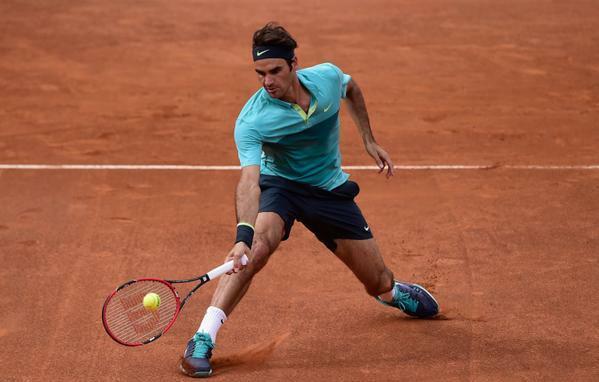 Like the commie said, Roger played flawless, until….. If it was another player than Anderson, he would have made Roger pay for it. When Roger got broken the second time, I was telling him very politely: “oke, this is your own fault, you made this mess, now FIX it” 🙂 Getting broken is…. oke…. not that bad, can happen to the best…..but you have to FIX it. And thank God he did. Now next is against my Berdy. Commie said very truely “Berdych against Italy” and “Davis Cup match”. Which it really was. If anyone saw The Fog play against Rafa or yesterday against Dimitrov, then you can only say that THIS Fognini is capable of winning more than one slam. Seriously, if he took his career more serious, he would be a really threat. You cannot know which Fognini you play against. The almost a genius or the crazy lazy clown. (Just like Monfils actually). Ps: Look out for David Goffin. He might lose tomorrow, but he is getting dangerous, I really like him. And… will we ever see Delpo back at the top?? Does he have bad luck or what……. Missing you Delpo… a lot…. Latest is that Delpo needs more wrist exams…likely to miss FO. Will he ever compete again?? I really wanted the Fog to win too Susie – such an exciting game he has when he’s focussed. Like Katyani says, if he played like that all the time… But kudos to Berdy for staying calm and focussed – fighting his opponent and the extremely vocal Roma crowd. It is very sad about Delpo Katyani -he seems such a sweet guy, but those wrists are clearly not able to cope (atm) with elite tennis. Katyani: Like your post with the humour and all…………. Dude….again… I don’t do space cake 🙂 By the way… almost 4 years of the blog. Any celebration going on?? Good match except for minor blip closing out the match. Berdych is going to be difficult as he is on form and has been clutch of late. Hopes Roger brings out his A game here. PS – I sure do like this kit. Pity this is the last time we’ll see it; I think he should keep it for RG. RG purple polo looks like it might be quite nice though. Will do a post soon. Hi Katyani, Yes, I think Roger is thinner too. And the curls mean better tennis. Still has his tennis tummy tho..love that! Hair and body…now you are talking! You can’t tell from television camera though. Katyani has claimed he’s getting thinner for the past 8 months or something, so if that was the case he’d probably be a scarecrow by now. Looks like he put on muscle tbh. Bigger legs for clay. Brother Jon…. but he IS getting thinner and thinner…. can’t you see?? Didn’t we all get nervous at the 5-5? Some people says Roger is in some lack of killer instinct. Was that it? Or just, like Katyani says, lack of thrill…? Anyway, agree with Jonathan – straight sets – Roger may surely be more focused today, and seems in superb form! Am I the only one out here who doesn’t care if Fed loses today, because all a win tonight is going to mean is another match, another loss to Dull on Clay. Nah, Fed beating Berdych will do him some good for his confidence even if it means Dull is next. Fed will always be the underdog against Nadal so nothing to lose. Hoping Stan does the business!! And rooting for Kei to take down Novak…..
Yeah time for the Stanimal to rise! got back after lunch and realized that Roger already win against Berdych. From the scoreboard seems like Roger destroyed him. I need to see the re-run.